August 3, 2009. 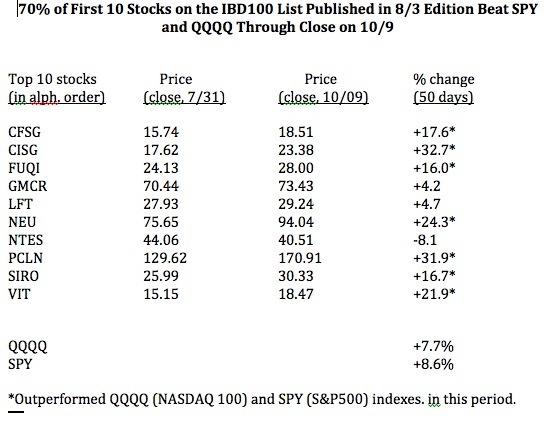 70% of these ten stocks that were at the top of the IBD 100 list outperformed the QQQQ and SPY, through last Friday. (TYH, the ultra 3x technology ETF, went up 25% during this period, again showing the advantage of riding these ETF’s over individual stocks. ) While it is true that some of these 10 stocks declined before they recovered, it is clear that many of them ended up doing quite well over the past 50 days after August 3. A similar analysis of the top ten stocks from the list published on July 27 also showed that 70% beat these two averages. The best 2 were CISG (+28%) and FUQI (+26.8%), with NTES again being the one loser (-4%). It looks to me like the top ten stocks on the IBD100 list may be worth investigating for potential buys…. Meanwhile, the GMI is at 5 and the GMI-R is at 9. A lot of stocks are breaking out as we go into option expiration this Friday. It never ceases to amaze me how the pundits focus on questioning the viability of the up-trend instead of riding it until it ends. When they all do jump on the bandwagon, it will probably be time to get defensive. Any yellow banding stocks worth noting? Plenty: PEGA, EMS, SXCI, LZ to name a few I own. We are getting over 500 new highs some days. It is therefore now more difficult to pick out the true winners. But a rising tide raises all ships! I have had a very profitable run riding TYH. If one can accurately pick the onset of an up-trend, TYH is the way for me. You’re right. Evidence is important. 1. 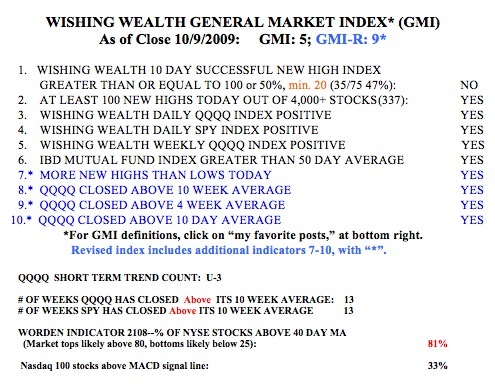 The strategy peaked on 5/10/2006 and bottomed on 3/11/2009. 2. The compound annual growth rate was 5.4%. The S&P 500 has a CAGR of 5.52% over the same period. 3. The Geometric Standard Deviation, however, was double that of the S&P 500 at about 46, compared to 23 for the SP500. 4. Daily Maximum Drawdown was -75% — you most definitely do need a way to get out of the market during bearish periods. Holding these ten stocks when the market is tanking will kill any allegiance you may have to stock trading. I use WordPress. My son set up the page and I have no html experience.